arresting innocent peaceful people – welcome! the police at it again!! arresting those who gathered at the anti ISA protest last night. over 20 arrested in PJ, 1 i ipoh and 4 in penang… where i was. i arrived at the esplanade at about 8.30pm and notice police cordoning off the roads leading to the esplanade. saw many police cars around. there were about 50 people spread out here and there. suddenly there were a group of malay men shouting “kami suka ISA! we are the silent majority!”. some people pointed out those men were from umno!! they were there to instigate the crowd! when one of the police shouted for us to disperse, these men joined in to should “ini perhimpunan haram” and i notice some of them pushed the crowd. (note: according to bk ong – read his account below – an old man was pushed). the police said they gave us 5 mins to disperse. so choon kai from PSM went to talk to the police. i heard him saying something about the policemen not acting professionally. then kris khaira (also from PSM) came to help choon kai out to negotiate with the police…. but halfway they talking, suddenly the police decided to arrest them! dragged them to the black maria on standby at the sea front. terrible!! later on, i was made to understand, another person, lawyer, darshan singh was arrested too. after the arrest, people still linger around here and there. the police then decided to block off the pavement area by standing there in rows. i try taking pictures but it seemed that the pictures turned out too dark. you can’t really see rows of policemen standing but they were there all right (anyway can notice the luminous strips down the rows, right? some were wearing those luminous jackets, some were not). all these excitement happened before 9.00pm (the scheduled time for the vigil to start). i guess those who came after 9.00pm missed the excitement but after 9.00pm, lots of MPs turned up. the first MP i saw (before the arrest, before 9.00pm) was my ADUN, YB sim tze tzin. later on i saw liew chin toong and i understand ng ah weik, wong hon wai, chow kon yeow were there too and they did giive a press conference. georgetown OCPD assistant comm, gan kong meng, gave a press conference on why those 3 people were arrested. the same story… no permit… blah blah… give warning disperse… blah blah. someone (it was sok hua, who used to be suaram member… or still is not sure) asked gan, “what about the umno people? has any of them being arrested?” and you know what, some other policeman shouted “you are not the press! don’t ask questions! questions are for the press only!”. wow. touchy. feeling of guilt eh? yes, those umno people who said they are for ISA were there clearly to instigate the crowd and they were shouting and shoving but none of them were arrested. see, 2malaysia – 1 for umno, 1 for non umno! then after OCPD gan gave his press statement, ong jin cheng suaram coordinator said he wanted to give a press statement too. so he was talking… not even 5 mins., suddenly 2 policemen run up and hold him and dragged him! the press run after them. the policemen dragged jin cheng to the black maria van. he was arrested! 4 people arrested now in total. wow! this was the first time i saw with my own eyes how the police came running up to arrest someone who was just talking… how two of them run up to jin cheng, put their hands on his shoulders and pulled him away. terrible!! after jin cheng’s arrest, there were still people mingling around and it was after that time too that some MPs from PR arrived. then i heard that those arrested were held at the jelutong polices station and several people were going to the police station to hold a candle light vigil to protest the arrest. i did not go because i have to catch the bus back. anil netto, who wanted to drop in the police station, was kind enough to drop me at the jetty to catch a bus. apart from personally wanting to be there as i’m a strong anti ISA supporter, i was also going around as reporter for UCAN to ask those who are christians their views on the ISA. interesting response i get. one of them, dr francis loh was saying that just after march 8, during badawi’s rule, because of their (BN) great loss, they were cautious and seemed to be more relax on gathering/protest and not disturb the gathering… but when najib took over, he seemed to be fearful of the people. when najib took over, the crackdown began! police were seen to be ‘disturbing’ peaceful people who want to gather because of their rights. ya i agree. methink the instructions came right from the top – stop the gathering! arrest people! this is very sad. what is najib afraid of? why can’t we have peaceful gathering? why are the policemen so free to disturb peaceful vigil-ers when they should be out there catching criminals? 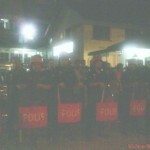 malaysiakini mentioned there were about 200 policemen and the people only about 100! imagine! the police more than the people! at a glance when i was at the vigil, i did notice already so many policemen. every corner i turned, police there. then as i told you where the policemen lined up in rows, you can clearly see so many of them. this is really ridiculous!! wait till you read ong’s account – how the police close an eye to the group of so called pro ISA people (the umno people) – ridiculous! read about the arrest at the malaysian insider here. malaysiakini report is below (updated). remember first, read the first-hand experience from bk ong. i will update with links as i found out who or where wrote about the vigil. In politics we are familiar with the 2 sides who oppose each other on ideas. No matter how fiercely they may differ they can resolve their differences through a vote in a legislature or a referendum among the public. However at the anti-ISA candle light vigil tonight I encountered a 3rd kind of `politics’ -which want to impose their ways through brute force. I arrived at the vigil scheduled for 9.00pm some half an hour early. I noticed police blocking the entrances to the Esplanade. I walked towards the Esplanade field where there are already some scattered crowds. Before I could say `halo’ to a few familiar faces the crowd started retreating from the sea side, dogged by a few uniform police. When the crowd was pushed out of the field the police stopped. So the crowd was milling around the edge of the field, just inside the walkway besides the main road. Then a group of fierce looking and foul mouth people in their 30’s or 40’s marched towards the scattered crowd. They don’t look like the anti-ISA civil society type. I could not resist taking a photo of them. That make them focus in my direction. I pretend to sit down on a concrete fencing at the edge of the field, adjusting my camera. Some of the folks above spoke in Bahasa Malaysia and instigated each other to do something about me. Then one of them embolden himself and came sitting next to me. He pretended to speak to his hand phone but pushed his elbow till it touched my face. He was muttering `Mau cari pasal? Mau cari pasal?’ He must be trying to pick a fight with me as instigated by a few other voices from that fierce looking crowd. I stood up and moved into the walkway slowly, avoiding the eye contact which could be interpreted as a sign of agreement to engage with him in the only way he wanted. Then guy next to me declared his victory by laughing with his friends. They make even more instigation eg to pull off my beard. Before the guy can come closer to me a police march in to shout at the folks above to ask them to disperse. The police only asked them not to force the police to make arrest of them-which is in strong contrast to the police’s preemptive arrests of 3 organisers of the peaceful anti-ISA candle light vigil earlier. The group quickly crossed the road and assembled defiantly at a corner outside a building of the Chinese Chamber of Commerce. The other side then moved to Jelutong Police station where the 3 persons arrested were said to be held. Later a 4th person was also arrested at the Esplanade. The close encounter of this 3rd kind who try to impose their will by force shows that our 1-sided, politicised enforcement of law had allow some political opportunists to push their luck. At the time of writing I received SMSes saying that the arrests had gone over 30 in PJ and Penang. Who knows how many more will lost their freedom tonight. But none of the group who pushed their way into the peaceful anti-ISA crowd had been apprehended. Why the police acted against peaceful citizens but allowed those who openly and blatantly instigate violence to go free? Do the police not understand Bahasa Malaysia? Or they had been given a different set of instruction when it come to upholding law and order on this special class of people? The police 1-sided attitude will tempt the above type of political opportunists to keep pushing their luck-till one day they may just embolden themselves enough to raise their hand for a strike. Why the situation can deteriorate into such a stage-where I came close to being victimised by violence under the watchful eyes of the police? May be some politicians calculate that by allowing these thugs to threaten and frighten the peaceful public it helps them to compel the public into submitting to their power? This thought is more frightening than the thugs above -fierce as they may look! Riot police have barred activists from holding candlelight vigils to commemorate the Internal Security Act’s 50th anniversary in eight places around the country with 36 activists arrested. At Dataran MBPJ, Padang Timur in Petaling Jaya, Selangor – which saw the earliest vigil begin at 8pm – members of the Light Strike Force (LSF) began dispersing the 300-strong crowd just as the latter began singing Negaraku while marching from the mall, through the adjacent carpark and towards the field across the main road. As they approached the field, they were confronted by a wall of LSF shields wielded by about 30 riot police, backed by another 50 uniformed police. he officer in charge informed that their gathering was illegal and told them to disperse. When the activists refused, the LSF rushed into the group and pushed them back as police personnel from other sides began arresting the activists. Police officers chasing the protestors out of the Dataran amid the activists’ shouts of “Hidup, hidup! Hidup rakyat!”, as other personnel formed a line to block more protestors from entering the square. At least five people were arrested immediately, including Abolish the ISA movement (GMI) chief Syed Ibrahim Syed Noh, Parti Sosialis Malaysia (PSM) secretary-general S Arutchelvan and PKR supreme council member Badrul Hisham Shaharin. The activists then retreated to the car park and enterd Amcorp Mall, as the LSF and other police formed a cordon in front of the mall entrance as they arrested those dressed in red – the ‘official’ colour for the vigil – and wearing ‘Abolish ISA’ badges. Several activists were arrested as they tried to break out of the police cordon. Siti Kasim (right) from the Bar Council said this was the first time she had seen the police acted with such violence and going to the extent of arresting people even as they enter the nearby Amcorp shopping mall. “This is very bad. Very violent and unacceptable. We are shocked,” she told reporters. Human rights group Suaram’s director Kua Kia Soong also expressed shock and condemned the violence by the police. “It’s disgusting. This possibly could have been a peaceful vigil. What is the aim of the police (doing this)? 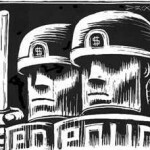 It’s going to make Malaysia more like a police state. “Today is a very important day. Laws like the ISA only exist in very few countries nowadays. This law allows the authorities to detain people without trial. It’s very shameful, and for the police to behave like this, makes Malaysia even more shameful. “This is the first time I saw the police rushing and breaking the peace in shopping mall. This is very bad for business,” said Kua. Other than Ibrahim, Arutchelvan and Badrul Hisham, the other individuals arrested and brought to the Petaling Jaya district police station included Suresh Kumar, Mohd Fiqtriey, Naqiuddin Sahar, Albert Ang Yik Chuan, Yew Hun Ng, Ng Yap Hwa, Tsuing Han See, Enalini Elumalai, Mien Lor, Thilaga Sokiapillay, Kohila Y, Bawani K, Parames E, Sivaranjani, Lee Wei Ni, E Sarawanen, Xavier Sim Yoon Han, Aiman Siew Teck Meng, Sheikh Omar, Lim Jian Xin, Muhd Firdaus Khalid, Abdul Aziz Mohammad Ahmad and Rozan Azen Mat Rasip. By around 9:15pm, the police had stopped their dispersal and arrests. At a press conference held shortly after, Petaling Jaya police chief Arjunaidi Mohamed (left) said the organisers did not obtain a permit for tonight’s gathering. He went on to defend the police action on the basis of the protestors’ defiance of police orders to disperse. “We asked them to disperse, but they refused and went into Amcorp Mall. “When they came out, they scolded the police and challenged us, so we made the arrests,” said Arjunaidi. He revealed that a total of 25 adults – six women and 19 men – were arrested for illegal assembly. Though there were children in the gathering, none was arrested, said Arjunaidi. “There were kids involved in the demonstration. In fact, we were more than lenient with them. They only care about their purpose,” he added. Selangor CPO Khalid Abu Bakar later said that the police arrested 30 people in Petaling Jaya in total – eight women and 22 men. It was only at 3am that those arrested were released – one by one – under police bail. They were ordered to report back to Petaling Jaya district police headquarters on 16 August. 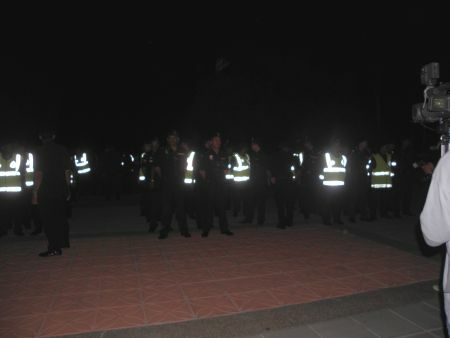 In Ipoh, Perak, similarly, dozens of police officers had cordoned off the Dataran Majlis Bandaraya Ipoh and protesters were barred from entering the venue. About 200 people, nevertheless, participated in a 30-minute vigil which concluded without incident. In Penang, the police had earlier today posted notices – signed by Georgetown OCPD Asst Comm Gan Kong Meng – around the Speaker’s Square in Georgetown warning against any illegal gathering in the area. Even before the vigil began at 9pm, two activists – Choo Choon Kai and Kris Khaira from PSM – were arrested. At the same time, about 10 persons suddenly appeared claiming to represent “those who support the ISA”. Two more activists – lawyer Darshan Singh and Ong Jing Cheng of Suaram – were subsequently taken by the police to Jelutong district police station. All four activists were released a little after midnight under police bail after their statements were recorded. They have been directed to report back to the Jelutong police station on 14 August 2010. Lau Shu Shi of Suaram was also taken into custody after a warrant was served on her, but this was said to be over an earlier case. She has been ordered to appear in court on Monday. In Kelantan, anti-ISA vigil coordinators Zaidi Musa and Hamidi Musa were held by the police after the anti-ISA event ended successfully. Zaid and Hamidi were released under police bail at about 2.50am, and have been requested to report back to the Kota Bharu district police station the next day. Speakers’ Square is for the public to raise any subject under the sun… except issues against the country’s laws, said Penang police. Police acted to disrupt the anti-ISA vigil tonight as the force has received information that there would be trouble from a particular group, believed to be linked to Umno. When asked if the police knew about a group of pro-ISA members believed to be Umno representatives gathering at the Square, Georgetown OCPD Asst Comm Gan Kong Meng conceded, saying ‘Yes, they tried to create trouble and agitate”. Speaking to reporters after the arrest of four NGO activists, Gan said that the police had received information about the NGOs gathering the previous day and had set out a plan to break up the rally as it was ‘illegal’. “When we received the information, we made a plan because this gathering is illegal, under the Police Act and Penal Code Section 143,” Gan told reporters at the Speaker’s Square. “Before 9pm, about 25 NGO representatives gathered and started to speak against the ISA, so we gave warning for them to disperse,” he added. “However, they did not disperse, so we gave them five minutes, (but) they still protested and we then managed to arrest three of them,” he further added. Their statements will be taken for further investigation, he said. Gan was rather upset and raised his voice when asked why the police were arresting members of the public at the Speakers’ Square, when it was a place to express their views freely. “The session at the Speakers Square has ended. This is my version, you do the coverage, don’t instigate,” he reporters although the Square is allowed to be open for public speaking until 10pm on Wednesdays and Sundays. Gan said issues about laws should be raised in the Parliament by parliamentarians, not at the Square. “It is not that we do not allow people to express themselves, but here at the Speakers Square we do not allow issues against any laws in the country,” he added. As at 10pm, a large group of policemen were still lingering at the Square, while NGO representatives and the public gathered in several groups, waiting for more action. A group of 30 people, meanwhile, gathered outside the Jelutong police station, where those arrested were brought to, and have begun a candlelight vigil. Earlier today, the police posted notices – signed by Georgetown OCPD Asst Comm Gan Kong Meng – around the Speaker’s Square in Georgetown warning against any illegal gathering in the area. At that moment, about 10 persons suddenly appeared claiming to represent “those who support the ISA”. Two more activists – lawyer Darshan Singh and Ong Jing Cheng (left) of Suaram – were subsequently taken by the police to Jelutong district police station. Earlier, Penang Chief Minister Lim Guan Eng said although this is a sad day as the ISA has been existance for 50 years, he hoped it would remind the people about the importance of freedom. “In Malaysia, there is freedom of speech, but no freedom after speech,” he said. The DAP leader also said Penang has tried to broaden the space for freedom of speech by having the Speakers’ Square at the Esplanade, which is a tourist spot. “It is very successful. So far no untoward incident has happened. It shows that Malaysians can exercise freedom of speech and able to reject extremism,” he told a press conference after launching a DAP fundraising event in the morning. “This is the path to national unity, to reject extremism and to perform well. Those who cannot perform, no matter what background, will be criticized,” he stressed. He said he was not making these comments as a former ISA victim, but as an ‘an activist for freedom and democracy’. “The ISA is anti-freedom, and together with other laws like the Official Secrets Act, Sedition and Publication and Printing Presses Act, should be abolished,” he said. 2 Responses to "arresting innocent peaceful people"
I missed the BK Ong incident report somehow! Thanks for bringing this up to attention. As usual, I would like to ask the police why they don’t act against the thuggery, but choose instead to act against the peaceful.